CraftyME decided to prep for Stitches by actually using some of the fiber-y goodness I acquired on my visit to Maryland Sheep & Wool Fest back in May. I mean I did kinda splurge a bit, so I should at least know if those were good purchases or not, right? They all pass the pretty test, but how are they to work with and will they make a pretty FO as well. Let's start with the biggest splurge, shall we? 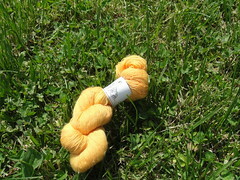 Had I not purchased this yarn, I would have probably stayed pretty close to my MDS&W budget. It was a bit pricey. 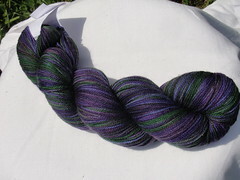 But I had I not purchased this yarn, I would not have been able to make the awesome-ness known as my RockStar Coachella. 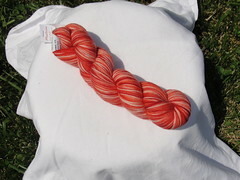 I loved working with this yarn. If $ were no object, I would def add this to the SE list. Um yeah, no. I can't say that I care for this yarn. But it has nothing to do with the quality of the yarn. I just came to a realization after trying to make the famed Citron. 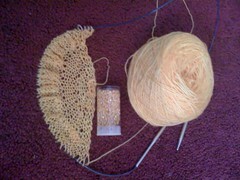 Me and lace weight yarn do not equal a match. It is entirely to light for my tastes. I felt like I was gonna break it the whole time. I considered adding beads to try to weigh it down a bit. 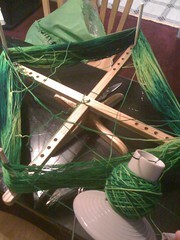 But yeah, I tossed this project in the "Sure I'll finish this....one day..." basket with the quickness. I like this yarn. I like the way it feels to work with it. I like the color. I don't love the color. That's the only thing. 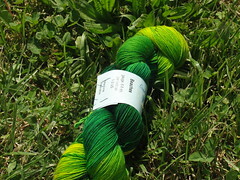 I'm not a fan of variegated yarn. I wasn't sure how this was gonna knit up, but it was so pretty in the skein. Luckily, it's not uber-pool-y like some variegates. So it gets a like. Maybe in another color-way it could get a love. Now as for this project, it's in time out. You know how I posted about life lines? Yeah, well some how one of my life lines didn't stay put like it was supposed. And it just happened to be discovered as I was finishing up the last row in a chart. The row that as soon as I finished it, I would have been adding a lifeline into the next one. Yeah that one. So instead of a FO we've got a TO until I feel like frogging back to the previous lifeline. I LOVE this yarn!! The color is beautiful and working with it is a dream. 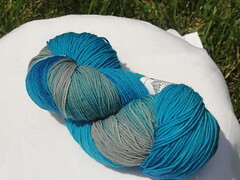 It's slightly heavier than the other sock yarns that I have used to knit sox. And that makes the sox just fly off my needles. Had I not taken the time to work on some other projects, I would have been finished with my Iris Ivys. I'm definitely buying some more of this stuff. 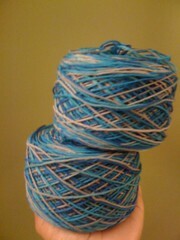 The color of this yarn is so pretty. 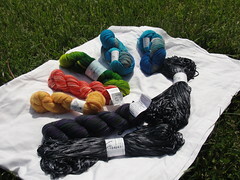 And I have 2 skeins. I just don't know what to make with it. But in the efforts to sample, I did go ahead and wind it up. 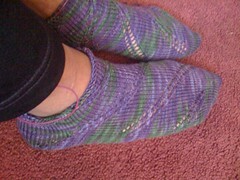 I'm torn between making the Revontuli wrap or just casting on some sox. 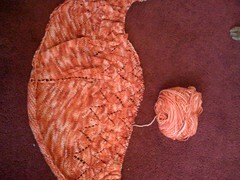 I don't really know if this yarn is gonna be stripey, variegated, or some where in between. Hmm what to do, what to do? We'll come back to this one. 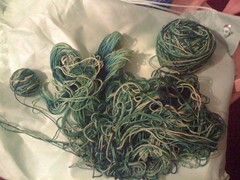 Ugh this yarn is the bain of my existence right now!! I love the colorway. Such a pretty green. So much yardage. 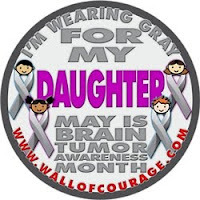 And I even have the project picked out for it. Well 2 projects that I can't decide between, Fizzi or Multnomah . But IDK what happened. After I wound up the Tess SuperSocks, I put this one on my swift. 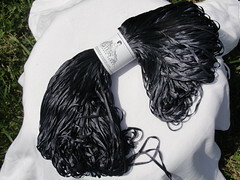 Very quickly it became apparent that something was amiss within the skein. And now I'm left with this. I spent a whole night trying to detangle and wind by hand. Dude if I didn't spend damn near $30 on this yarn, I would so be throwing it in the trash right about now. So it too is on TO until I feel like diving back into the detangling process. As it stands right now, I will be adding Miss Babs Windsor to my must purchase list. 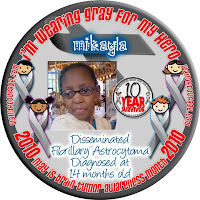 And Tess MicroFiber ribbon will go on the splurge list. Next up we'll see what vendor list stalking will turn up. Stay tuned.